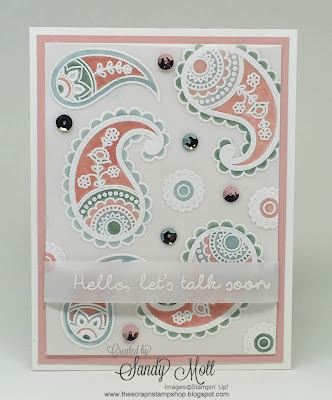 Welcome to our World Card Making Day Blog Hop! I am so excited to be participating in this international Hop this year. You will find a lot of amazing inspiration on this hop. Thanks so much for visiting me - I'm Sandy Mott, and I live in Metropolis, Illinois. You will be visiting a lot of different places today! There is a list at the end of this post to help you move along from blog to blog so you can see more amazing projects. I needed to make a special card for a friend, so I took a break from making Holiday cards. This soft, pastel card is for my friend. She is moving across the country from me next month. I miss her already and she hasn't left yet. Although we haven't been best friends for very long, it sure seems like we've been friends forever. And what better day than World Card Making Day to showcase a card for your bestie. I based the colors for this card on her personality...gentle, loving, easy-going, and so very sweet. My dear friend Sue, this card is for you. I used the Paisleys & Posies stamp set from the Holiday Catalog. I love the detail in these stamps. First, I embossed these wonderful images with White Stampin Emboss Powder onto a 3 3/4" x 5" piece of Vellum. Then I colored the paisleys on the back side of the vellum with Mint Macaron, Blushing Bride, and Soft Sky markers. Coloring vellum on the reverse side of the embossing softened the colors perfectly. I then mounted the vellum onto a 4" x 5 1/4" piece of Blushing Bride cardstock. The card base is 5 1/2" x 8 1/2", scored at 4 1/4", and is Whisper White cardstock. I added Fancy Frost Sequins in Blushing Bride and Soft Sky because everyone needs a little bling once in a while. The sentiment "Hello, let's talk soon", is from the "Better Together" stamp set. A complete list of supplies used to make this card is at the bottom of this post. Thanks for visiting my blog today. I hope you enjoyed my card and I would love to hear from you. Be sure to check the blog line-up below and visit the next person on this list! Prettiest Paisley card I've seen so far! You've got a great eye for color Sandy! Very beautiful! Love your colour combo! 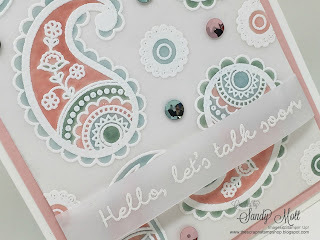 Gorgeous Sandy, love the embossing of the paisley. Thank you Kim - the embossing and coloring is so fun! One of my favorite sets and love what you did with it. Hmm. I've been undesided about this stamp set. Love the colors you used. I may have to rethink getting this set! Thank you Donna! I was hesitant about getting this set, but so glad I did! Beautiful! This is one of my favourite bundles at the moment! Thanks Xandra! It's fast becoming my favorite as well! This is so pretty. I don't have this set but the more I see cards using it I want it. Thanks for the inspiration. Thanks so much Rochelle! So glad you're getting the set...you can do amazing things with it! Sandy, this card is gorgeous! Thank you so much Terri! So fun to make!